Are you interested in beekeeping but don't have the time or space to set up a colony of your own? Consider buying a share in a beehive! We will add your hive to our apiary, manage the colony for you, and send quarterly email updates on the progress of the bee yard, along with photos of your bees at work. As a bonus, you will receive a portion of the harvestable honey from your hive at the end of the season! Enjoy the fun and benefits of beekeeping without the chance of being stung. A hive share, renewable annually, is a great way to support bees and to connect with a source of sustainably raised honey. It is a way for people to help share in the costs of beekeeping without the extra responsibility of personally managing a hive! We do not use any antibiotics or chemical treatments in our hives and try to manage them as close to nature as possible. A hive share also makes a fantastic gift for any bee (or honey!) lover in your life. A list of our current and past hive share sponsors is here. We are now taking reservations for hive shares for the 2019 season! Fully sponsor an entire new colony of bees for a year - a single share for an entire hive. A certificate of sponsorship for your hive, emailed to you. Information about your hive detailing where your bees came from and how they were set up, accompanied by photos (shared on our web blog)! Your name added for the year to our bee-friends thank you list on our hive share website! At least six 1lb containers of raw honey from your hive. If your hive does not produce any excess honey, the honey will be shared from one of the nearby hives within the apiary. If your hive produces more honey, up to twelve 1lb containers of honey will be sent to you! 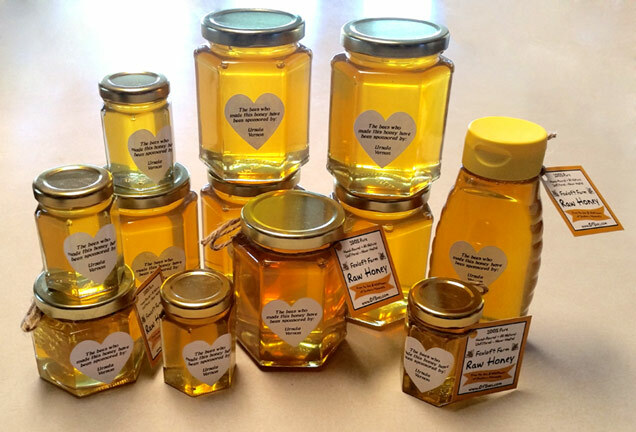 Custom honey labels featuring your name - great for gifting! The opportunity to visit your hive if you are in the area and meet your bees! For the meadmaker who is interested in a larger quantity of fresh, raw honey for meadmaking. Fully sponsor an entire colony of bees for a year - a single share for an entire hive. A sponsorship for half of a hive of bees. A fourth of a hive sponsorship. A supplemental share in a beehive. A thank you certificate of sponsorship for helping bees, emailed to you. Exclusive opportunity for hive share members to purchase that year's honey before it is released to the public. We produce a very small amount of excess honey each year and will send out an email allowing you first chance at it, if you wish to buy! What over 50lbs of honey for our 2014 hive sponsors looked like! When is honey from my hive share sent? We extract honey in the fall, generally mid-September to the end of October depending on the weather. We only take excess honey from each hive (if the bees make more than they need to survive the winter). We cannot guarantee that your hive will produce excess honey, but if it does not you will receive honey from another hive within our apiary, ensuring that everyone gets to share in the delicious ambrosia! So expect your hive share honey around October-November 2019. What does the cost of a hive share go towards? The average cost for us to set up a new hive, including all necessary equipment and bees is about $475. Your hive share helps cover the cost of this equipment, installation, and maintenance of the bees throughout the year. If you would like to learn more about what the weekly maintenance routine looks like please check out the rest of our blog for details and a look inside the hives! Funds from hive share adoptions also go towards experimenting with new methods of natural pest control, taking beekeeping classes to further our knowledge, replacing or upgrading bee yard equipment, and working to restore native prairie to our farm. Thanks to sponsors over the last few years, we have been able to restore a full three acres of native prairie (including over 50 species of flowers and grasses)! When should I order a hive share? New hives are installed in the spring, but we are limited in the number of new hives we can add and manage in a year, so we recommend purchasing your hive share early if you want to be sure you get one before we run out of available shares! Can I order more than one hive share? I would like to give one as a gift. Yes! We are happy to accept multiple sponsorships! How does a visit to my hive work? We are located in the bluff country of south-eastern Minnesota. If you are local or visiting the area, you are welcome to come and 'meet' your bees! We will be offering once a month 'open house' dates where visits will be available (these dates will be e-mailed to our honey share members). Please realize our farm is very rural, requires the crossing of a small stream on foot, and doesn't have amenities. It's a wilderness adventure to trek out to the apiary site! There is no obligation to visit, we are happy to send photographs so you can enjoy your beekeeping vicariously. I live outside the U.S.A. Can I purchase a honey share internationally? Yes, we do offer honey shares to international clients - however, shipping honey outside the U.S. is very expensive and will be dependent on your country's laws as to whether you can receive raw honey or not. You have the option of purchasing the hive share above and having it shipped to friends or family within the U.S. (it makes a wonderful gift) or please contact us before purchasing to work out shipment details. We will provide quotes for the extra cost of international shipping (and available options) upon request. Otherwise please consider the 'Friend of the Bees' subscription option! Thank you for considering our adopt-a-hive program!! Please join our email list on the bottom right of this page to be notified when 2020 shares are available (fall/winter 2019).